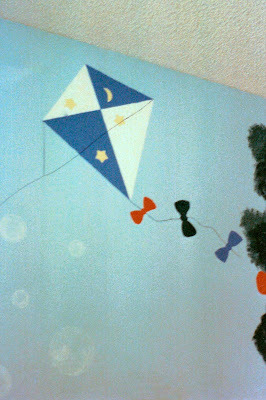 When we adopted our son back in January of 1987, I painted his room a pale blue and then painted children on it from the Joan Walsh Anglund books. The books are only 4" x 6" so very small illustrations to draw from. 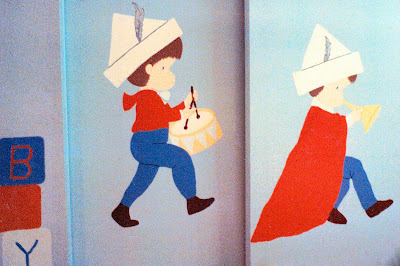 Here are 2 illustrations from the books I used to create part of the mural. 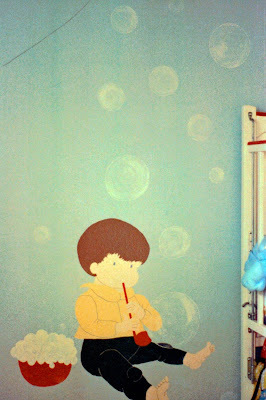 Here are photos of the mural I created across the walls and closet doors. The colors are not the best since from 1987 photos. 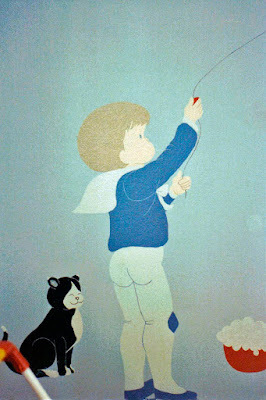 I painted a boy flying a kite as his cat looks on. You can see the bowl of soap bubbles another blows. I used the idea of the illustration above. Creating the bubbles was quite the feat! 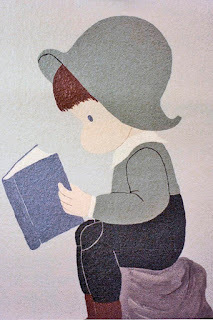 This little boy sat on a rock reading a book. 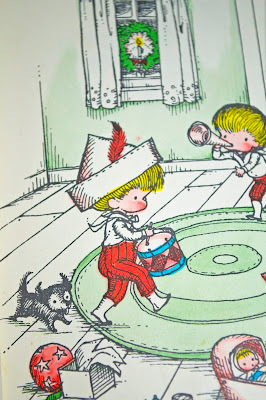 His shirt and hat were really a pale green. 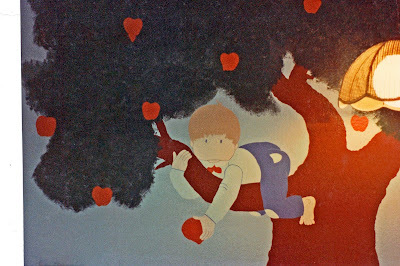 This little boy was picking apples from a tree. The tree was green. 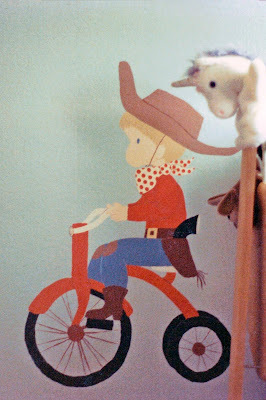 One of her books was about a little boy who dressed as a cowboy. I drew this from an illustration in that book. This one was inspired by one of the illustrations I showed above. They are painted on the closet doors. My son would love to "chat" with the friends on the walls of his room! Wow, Rose! It looks like you ought to do another mural in your new home. What a talent you are! Those are really adorable and your did a fantastic job. What a gift you have. And what a splendid room! He was a lucky boy to have you for a mom. Such loving art. Beautifully done. What a fabulous mural! You're so talented. Oh my gosh--I just love these! 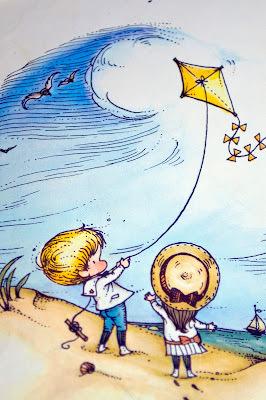 I still have a few of those books and the illustrations are lovely. What a great job you did! Oh wow Rose! You are quite the artist! Your mural is perfectly done. I can imagine your son having conversations with the kids, they look so cute! What a cool thing you did for Jimmy. I'm so very sorry that drugs caused a lapse in sensitivity and love toward you. Sharon W.
Rose, the mural is wonderful! What a lucky son to have it. I love the new rose header! So appropriate for you! Oh my what a wonderful talent you have! I'm sure your son has wonderful memories of this room! So charming Rose. You have such a gift of creativity. Love all your choices. Wiw! This mural was amazing! what a great mural! great memories I am sure! WOW! You did a great job on those! Rose your posts have not been coming up in my blog reader and I have missed quite a few - you are a very good artist and I love your wall mural, it's so delightful. What a wonderful way to decorate a child's room.